Shosan Victoria Austin, a yoga teacher for over twenty-five years, and Zenkei Blanche Hartman, former Abbess of City Center, will lead the next Practice Period, titled The Body as Great Vehicle Practice, starting January 21. Here they are, discussing the role of the body in Zen practice. 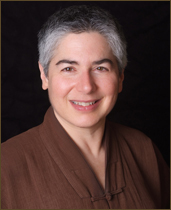 SVA: Darlene Cohen and I once led a Practice Period together called “Aligning the Body with the Precepts.” We always promised each other we would do another one, but we never got the chance to before she died. Blanche, Darlene�s ordination teacher, and I are trying to fulfill that promise. [In light of] Blanche�s experiences as a mother, grandmother, and a great grandmother, we�ll ask how do we mother ourselves? What is the mothering side of practice? ZBH: Dogen Zenji didn�t give dharma transmission to Tettsu Gikai because he hadn�t developed grandmotherly mind. 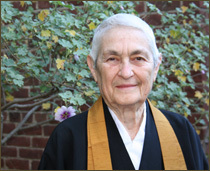 Dogen talked about three minds: joyful mind, big mind, and nurturing, or grandmotherly, mind. The essence of grandmotherly mind is nurturing everybody around you and yourself. We have to find a balance between strictness of practice and taking care of the vehicle with which we practice. This body. It�s all very well to be the mind of the Buddha but what carries it around and allows it to function? Buddha nature becomes expressed in a body and some of us have limitations. Here, the practice is open to everyone. So we have to work with how to focus our minds and study how it works with the body that we have. SVA: Though in our culture we talk about body and mind as one, in actual practice we often treat the mind as having high status and the body as an unwilling contraption we drag along. That�s duality. From ancient times people have talked about the Buddha way but how do we realize it? You can�t realize it without the body. How will aspects of intention and the breath play into this practice period? SVA: When we deal with differences, the varieties of our bodies, breath is the unifying factor. As my yoga teacher, BKS Iyengar said, “Where there is breath there is consciousness; where there is consciousness, breath.” [As for intention], motivation is karma and it�s also dharma. It�s the energetic force that drives the activities of practice. We often ignore the physical and emotional aspects of that. In this practice period we�ll address them. We may find something surprising: Instead of the body being the poor cousin of practice, when we study breath and intention, it actually is practice. ZBH: Well, practice wouldn�t be possible without it. SVA: Yes, and if we dignify the basic physical part of our lives with attention, we understand it�s� really important to our practice. Buddha taught the middle way with the body, so we�ll explore that. ZBH: I suspect there will be people who will find it useful to become more aware of what their body needs in order to support them in their intention. It�s all very well to want to save the world but you have to find a way to function physically in order to make that effort. This is not to say that [this Practice Period] is not suitable for totally able-bodied young people — we would like to include everyone. If you are disabled, we�ll include you. If you�re totally able bodied, we�ll depend on you. Do you have thoughts on why we can tend to forget about the body as we practice? ZBH: What I find is that we compare ourselves to others and judge whether we�re doing it �right� by how we measure up to someone whose body is different than ours. In my case, a body that’s a lot younger. Most bodies around here are. There�s this human tendency to compare to others; we need to respect the body we have and learn how to engage it in practice.� We need to learn how we can find some posture that will allow us to be still and study what�s going on without judgment. SVA: There are many stories that people tell about the body; yogic practice with the body predated, and was a foundation for, the enlightenment of the Buddha. His secret was to treat the body with moderation instead of indulging or starving it. 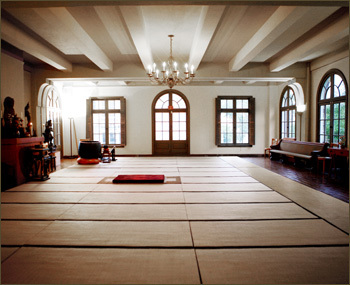 Suzuki Roshi�s big revolutionary act, when he came to this country, was to have men and women practice together. That decision has many ramifications for body practice. It implies that different varieties of people can practice together. Not� just men and women but people [of all different kinds] can enter the Middle Way through Zen practice, and directly experience its meaning. For more about the upcoming Practice Period led by Blanche and Victoria, click here.